The rabies vaccine involves administering a small dose of killed virus in order to provoke a response from your dog's immune system, triggering it to create antibodies to fight future infection without actually giving your dog the disease. There is also a form of the vaccine available for people who work in high risk jobs that might bring them in contact with infected animals. Rabies is a deadly viral infection that attacks the brain and central nervous system, and can easily be transferred between affected animals and humans via contact with infected saliva and blood. For this reason, giving your dog the rabies vaccine is not just an option, it's the law, and it's the only way to prevent the transmission of the disease and its agonizing symptoms. Each state in USA has their own statutes regarding when and how the rabies vaccine is to be administered, although many cities and counties have additional rabies regulations that must also be taken into consideration. Once your pet has received the vaccination, your vet will give you a rabies tag to add to your dog's collar. This will provide proof that your pet has indeed received the rabies vaccine, and it will list the year it was administered and your vet's name. Nearly all municipalities require this tag to be worn at all times. It's possible to purchase the vaccine through retail veterinary supply catalogs and give the injections yourself. While this can provide medical protection for your pet when administered properly, most states will not recognize such a vaccination as valid, and legally require that it be given by a licensed veterinarian. There are two basic types of rabies vaccine, a preventative vaccine that is available for both dogs and humans, and the post-exposure series of vaccinations given to individuals that have been bitten by a suspect animal. Keeping your own local rabies vaccine statutes in mind, the initial dose of the rabies vaccine is generally administered to a dog between three and six months of age, with a follow-up booster being given at the age of one. Then according to the type of vaccine used, and your local laws, your dog will need to receive future boosters either on an annual basis or every three years. Each vaccination requires a period of thirty days afterward for your pet to build up peak immunity levels. 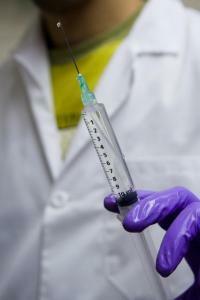 The rabies vaccine is traditionally delivered by one of two routes. A subcutaneous, or intradermal injection is one that is given just under the loose skin between a dog's shoulder blades, where the vaccine is gradually absorbed into the blood stream and the process of building immunity to the disease begins. An intramuscular vaccine is injected directly into muscle tissue, usually in the thick muscles of a dog's thigh. An oral vaccine for rabies has also been developed, and has been under field study in North America and Europe since about 1990. Currently the oral vaccine is only licensed for use in wild animal populations, and only time will tell if the vaccine will be approved for use in household pets. Rabies is simply too dangerous a disease to be ignored, so it's crucial to vaccinate against it to keep its spread in check. However, the type of vaccine used, and how often it is required to be administered are both governed by your local authorities. Your veterinarian should be aware of the legal requirements for your area, and be able to provide you with a proper schedule for continuing rabies vaccinations throughout your pet's life. World Health Organization, offering rabies regulation info for Europe. World Health Organization report on the rabies symposium in Asia.